You are here: Home / Web Development / SEO / Disavow Links Tool: Are Your Back-links Negatively Affecting Your Ranking? Many sites recently suffered a big demotion in terms of Google ranking, and consequently the amount of organic traffic they receive, due to one of the Google Panda updates. Was your site one of them? Well if it was it was probably due to a few reasons, one of which may have been due to excessive number of unnatural and low quality (spammy) back links. In the past couple of years there has been quite a concerted crackdown by Google on sites deemed to be of low quality or those seen as “spammy” in nature from the viewpoint of Google. This includes sites which have an “unnatural” collection of back links. As you may already know, back links are only one of the many indicators which Google uses to calculate the page rank of a website or web-page. Over the years, the number of back links pointing to a website was one indicator which was quickly learned by most webmasters to make a significant difference to rankings, and as a result, many website owners poured a huge amount of effort in building as many back links to their site with the aim of catapulting their way to a higher page rank. Unfortunately things got out of hand and a lot of people resorted to back-link-building techniques which most people (especially Google) considered to be a disreputable practice and a form of cheating. Even more importantly, the quality of search results was being affected because Google was finding itself displaying poor quality sites on the first few pages of search results on account of the sheer amount of back links these sites had pointing to them. Website owners were going crazy trying to SEO their sites using strategies which resulted in a massive number of unnatural back links being pointed to their site in a very short amount of time. Perhaps you undertook something similar with your site and built back links by commenting (or spamming) other blogs or forums. Or maybe you hired some so-called “SEO expert” to optimize your website. But as we all know, the people at Google are a very smart bunch and they have been working quite hard to combat this cancerous practice by penalizing those sites which they considered were cheating the system with unnatural SEO practices. Google is always trying to make it harder for those attempting to game the system and the most public demonstration of this is their release of several search engine algorithm updates in the past couple of years, some of which were given the names of Penguin and Panda. Now we all make mistakes in our lives, innocent or otherwise, and the good thing is that Google is giving people the opportunity to somewhat redeem themselves by voluntarily giving them the ability to remove the spammy back links pointing to their site. This is in the hope that it will wipe most of the slate clean and give people the opportunity to improve the rankings of their penalized website over time in a fair manner. Google recently introduced a handy new tool called the Disavow links tool which falls under the umbrella of the “Webmaster Tools” and which is designed to help site owners “disavow” or clean up unnatural or spammy back links which are pointing to their site. To use this tool you will obviously need a Google account and also you have to be signed up for the Webmaster Tools. Attention: Google warns that the disavow tool should be used with caution because removing the wrong links may potentially harm your site’s traffic and ranking. 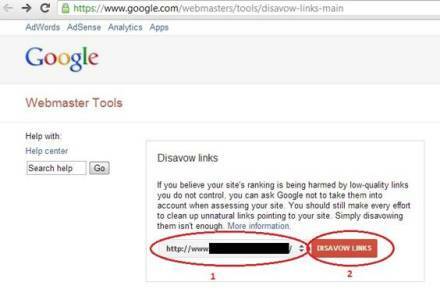 The disavow links tool is fairly straight forward to use. Below are some basic steps to get you started. Step 1: Log into your Google Webmaster Tools account and select your website. Step 2: To get a list of the back links to your site go to the “Links to Your Site” menu item as shown below. You can then download all links to a CSV file for easy manipulation and copying. You’ll note that Google has allowed for the ability to remove back links using two ways. One is via the use of the “domain:” prefix followed by the domain name (see first example in figure above). This will remove all back links from the domain without you having to specify each individual link. Alternatively you can remove links individually from any domain by specifying the link URL as shown in the second example above. Note that you can also add comments in your file using a “#” symbol. After clicking the button you will be presented with a warning before using the tool as shown below. To proceed simply click the “Disavow Links” button. Step 5: Now you will prompted to upload the text file you prepared in Step 3. Upload the file and then click the Submit button. Google says that it may take several weeks for the link removal to fully show its effects because your site will need to be re-indexed. It must be re-stated that you should only use this tool if you know what you are doing because it could have negative effects if not used correctly! I am your fan bro. .. thanks for sharing info like this!